Acrylic, 24" x 36" on 1 1/2" gallery wrap. Thanks so much for all of your kind comments about my painting yesterday. The response was amazing and the painting also sold! I was inspired to paint another one is a similar format. It's big, bold and I love it. Here is my painting in a very cool room. In case you need reminding, today is the 30th of January. It's the last day of the 30 in 30 Challenge! There were many times this month when I thought this day would never come. And now it's here and I am sad. I am going to miss the pressure of finishing my painting every day. But I plan to continue paintings almost every day. I have thought long and hard about what was my favorite part of this month's challenge. 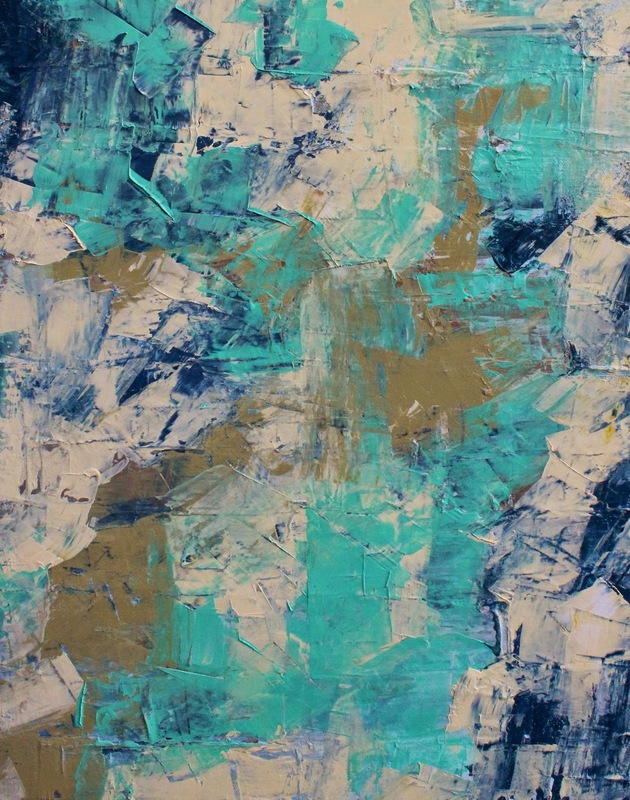 Aside from painting every day, it has to be discovering my love and joy in painting abstracts. Painting big, painting with acrylics, following my heart and having fun are the best way for me to describe the last 30 days. I am so lucky! Tomorrow I will post a collage of all of my 30 paintings. I will also post instructions as to how you can create one too. You can post your collage on my blog on January 31st. So be sure to check back tomorrow. Check out my 2015 workshop schedule. I am coming to Cape Cod, Atlanta, Charlotte and Richmond in 2015. Plus you can paint and stay with me in Ventura, CA at the beach house. Click here for more information. I am offering Online Studio painting classes every month. Join me each month as we paint boats, roosters, glass, beach scenes, umbrellas, etc. with a palette knife. Click here to sign up! Acrylic, 36" x 36" on 1 1/2" gallery wrap. I love this painting. It's big and colorful and represents a lot of what I have experienced and learned this month. It's been an incredible journey and a "life changing one" for sure. I hope you have enjoyed this month as much as I have. Here's to one more day! 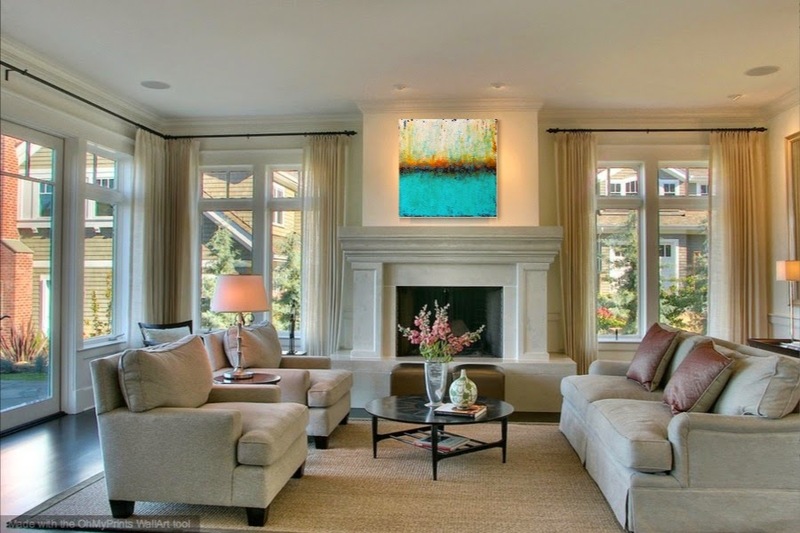 Here is my painting in a beautiful living room! I cannot believe it is Day 29. 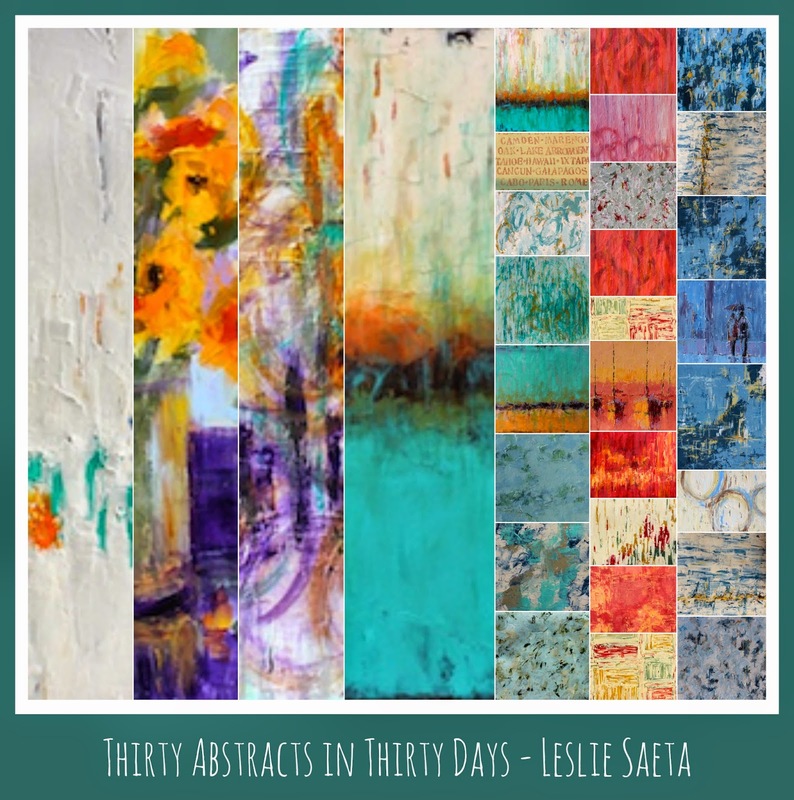 Only one more day in the January 30 Paintings in 30 Days Challenge. If you are an artist participating in the Challenge I am happy to say that on January 31st we will all create and post a collage of the paintings you have complete this month. Tomorrow's blog post will include all of the instructions and information as to how to create the collage. Check out my 2015 workshop schedule. I am coming to Cape Cod, Atlanta, Charlotte and Richmond in 2015. Plus you can paint and stay with me in Ventura, CA at the beach house. Click here for more information. I am offering Online Studio painting classes every month. Join me each month as we paint boats, roosters, glass, beach scenes, umbrellas, etc. with a palette knife. Click here to sign up! Acrylic, 18" x 18" on 1 1/2" gallery wrap. I now have the ability to add my paintings to photographs of rooms so I have included this photo to give you an idea of what my latest abstract might look like in a modern setting. I love the chair too! I am offering Online Studio painting classes every month! Join me each month as we paint boats, roosters, glass, beach scenes, umbrellas, etc. with a palette knife. Click here to sign up. I taught a one day Monday Open Studio in my Carriage House today and we painted large flowers in an abstract format. We had so much fun! I am covered with paint but it was well worth it! Check out my 2015 workshop schedule! I am coming to Cape Cod, Atlanta, Charlotte and Richmond in 2015. Plus you can paint and stay with me in Ventura, CA at the beach house. Click here for more information. I am offering Online Studio painting classes every month. Join me each month as we paint boats, roosters, glass, beach scenes, umbrellas, etc. with a palette knife. Click here to sign up! Abstract, 24" x 24" on 1 1/2" gallery wrap. 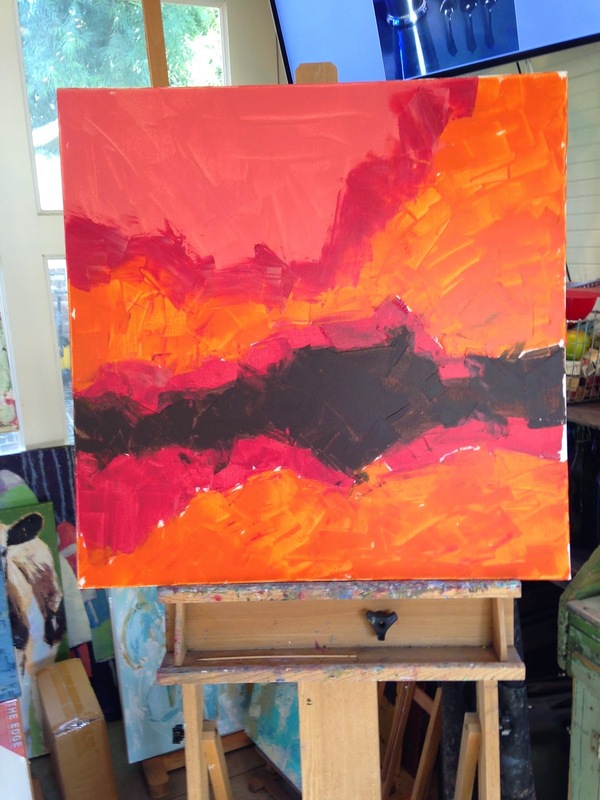 I believe a big part of painting abstracts is developing my color palette. So far I have only painted in my Fall and Spring Palette. Today I started working on my Summer Palette. It's a process and as the paintings develop the palette will change. But so far, I am happy! The summer palette is more muted and has a lot of fun pinks and greens and blues and yellows. So stay tuned for more paintings in these colors! Check out my 2015 workshop schedule. I am coming to Cape Cod, Atlanta, Charlotte and Richmond in 2015! Plus you can paint and stay with me in Ventura, CA at the beach house. Click here for more information. I am offering Online Studio painting classes every month. Join me each month as we paint boats, roosters, glass, beach scenes, umbrellas, etc. with a palette knife! Click here to sign up. This painting is truly a labor of love. It took me three full days to paint and it is very heavy due to the many layers of paint. As you know these colors are my favorite so I really enjoyed the process. Even if it did take me forever! I will share with you a little secret. While I have been painting my abstract paintings this month I have been "binge watching" all of the episodes of The West Wing. (Actually I think I have been listening more than watching.) The West Wing has always been my favorite show but I haven't watched the show in almost ten years. I was a political science major in college and always loved the oval office subject matter. I must say the show is even better the second time around! Aaron Sorkin is a genius. I am on season IV and I do not want it to end! So, have you ever "binge watched" a show on NetFlicks before? I have a workshop coming up in Atlanta in March. 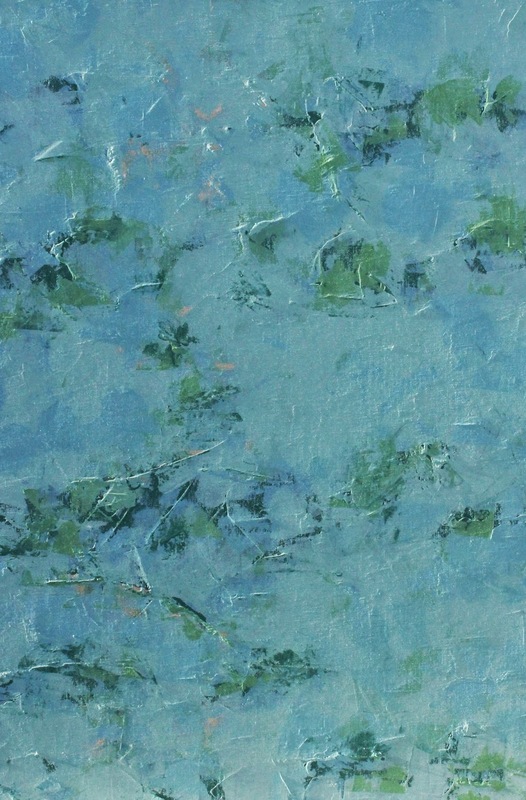 Although we won't be painting abstracts we will be painting very loosely with a palette knife. I hope you will consider joining me! The dates are March 16 - 18, 2015. Click here for more information. Here is the companion piece to the painting I posted yesterday. 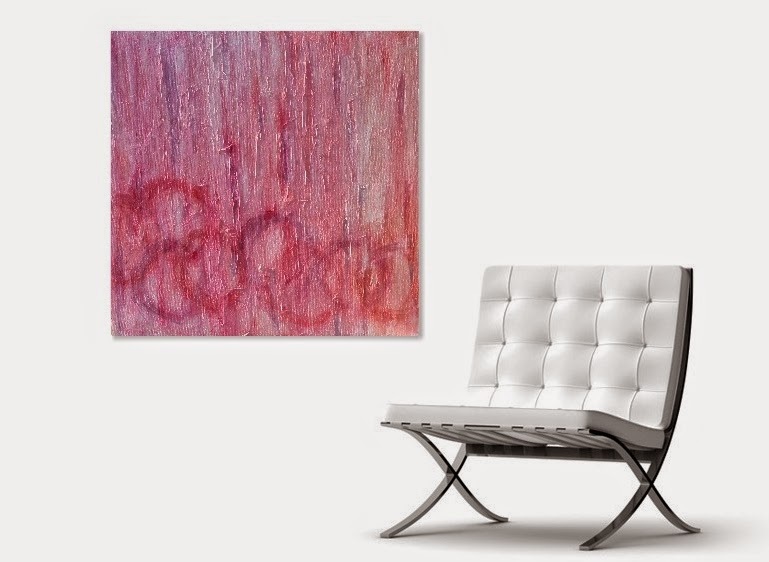 The paintings are titled "Cotton Candy" and "Bubble Gum". They could go side by side or on top of one another. I think they would look fabulous in a girls room! Acrylic, 18" x 18" on gallery wrap. This painting has layers and layers of paint. These two paintings took a lot longer than I had thought they would. There are four washes on each one, which are on top of lots and lots of paint. You can only guess how long it took me to paint these simultaneously with all of the layers! I will post the companion piece tomorrow. Acrylic, 24" x 24" on gallery wrap. 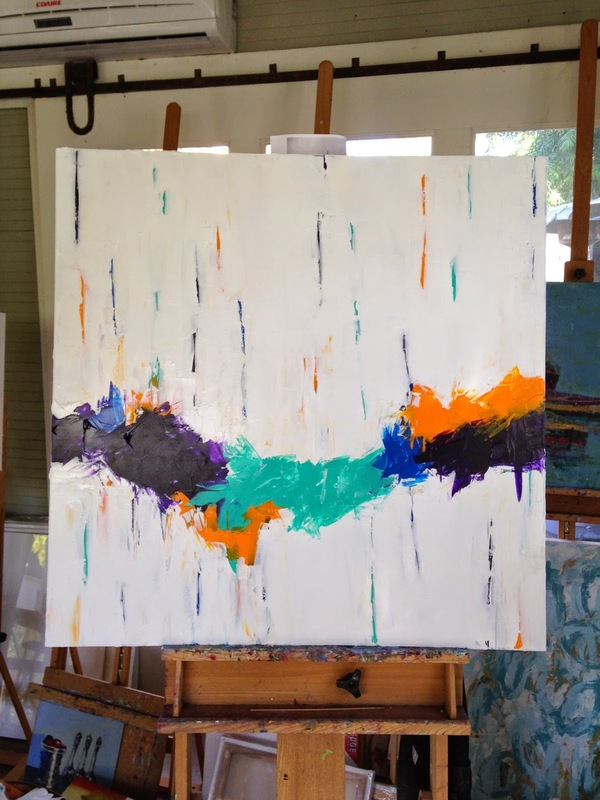 I was very inspired by the large 46" x 36" abstract I painted a few days ago titled "Floating Colors". I started this painting roughly the same way and I am very pleased with the outcome. 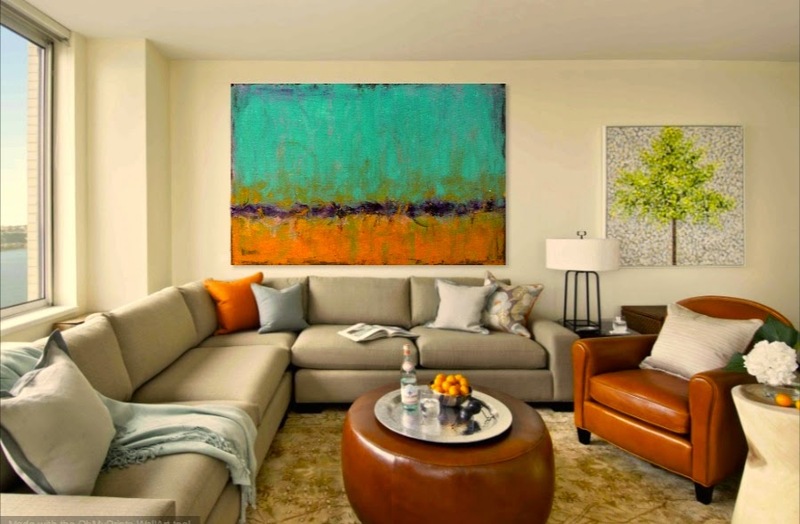 The colors in this painting match my family room perfectly so I think this one will hang in my house for a while. In case you hadn't noticed, it is day twenty of the Thirty Day Challenge. We are 2/3 done and really on the home stretch. Today is a great day to look back at your first twenty paintings. Examine what you have learned. Take note of the paintings you love. Then make a plan to spend the next ten days really pushing yourself in that direction! And of course, have fun! 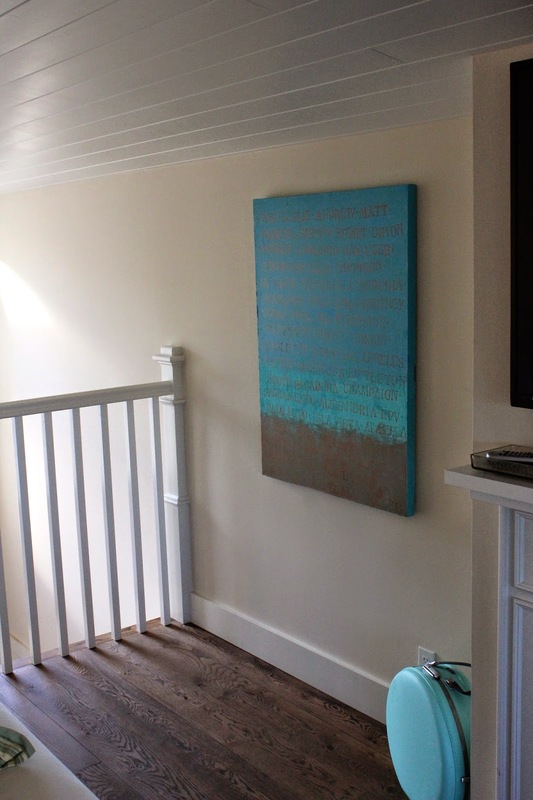 Don't forget, you can paint and stay with me in Ventura, CA at the beach house! Click here for more information! I am offering Online Studio painting classes every month! Join me each month as we paint boats, roosters, glass, beach scenes, umbrellas, etc. with a palette knife! Click here to sign up. I finished this painting today. 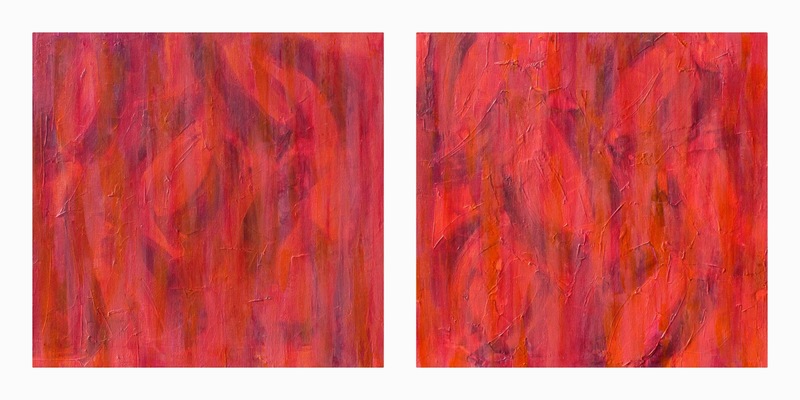 It's the third painting of a matched set and all three were purchased by a client. 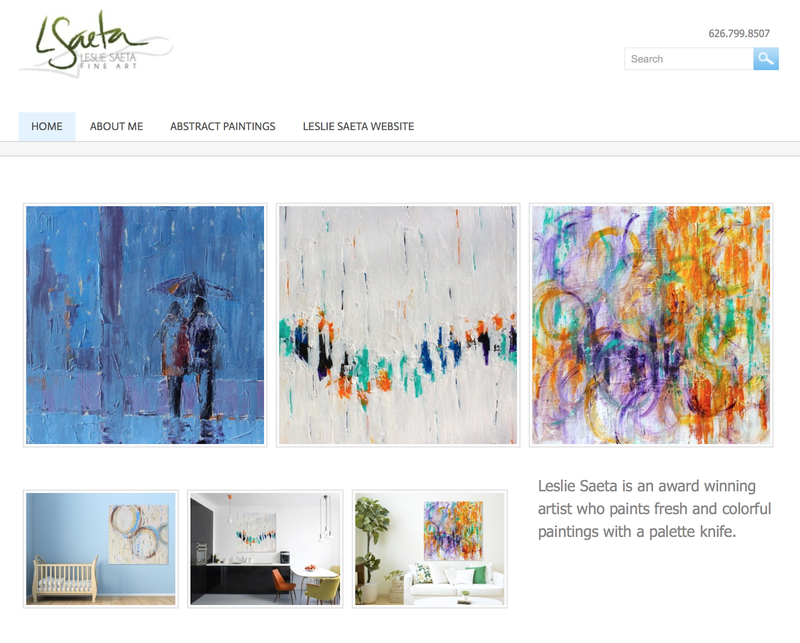 It was fun painting the three abstracts and the sale made it even more fun! As soon as I find the right colored wall to hang these paintings I will post the three of them together. Acrylic, 36" x 36" on gallery wrap. This is my largest abstract yet. it was a really great experience and I am not only happy with the design but I love the colors! You might get a laugh when you see how this painting started. I find with these paintings that I usually have a starting point in mind but the ending is another story. I have no idea where these paintings will end up! Fortunately I am happy so far with the end result. How would you have finished this painting? My three day palette knife painting workshop is finished and what a wonderful time we had! I am blessed with the most wonderful students and I love teaching workshops. Above is one of my paintings from the workshop. I have a workshop coming up next month in Atlanta and the dates are March 16 - 18. Click here for more information. So I know what you are thinking - where's the abstract? I painted two abstracts today but I decided to post one of my demo palette knife paintings I completed in my workshop this week (in case you thought I had forgotten how to paint with oils.) I really like this painting and thought I should include it here! I posted the abstract in the Inlinkz so you can see I did complete one today. "one half", "fifty percent", "mid way", "1/2", "half way done"
You can describe it however you want. But today is a big day. We hit a HUGE milestone. That's right - we are HALF WAY done. Today is day 15 and the hard part is over. Painting daily is becoming more of a habit than a task. More fun than stressful. We are on the downhill slope! Thanks for all of your wonderful comments and "likes" of the painting I posted yesterday. It's titled Stormy Weather and the response was pretty amazing. I am pretty sure that is a direction I will be seriously considering with my abstracts. The past 15 days have been incredible. 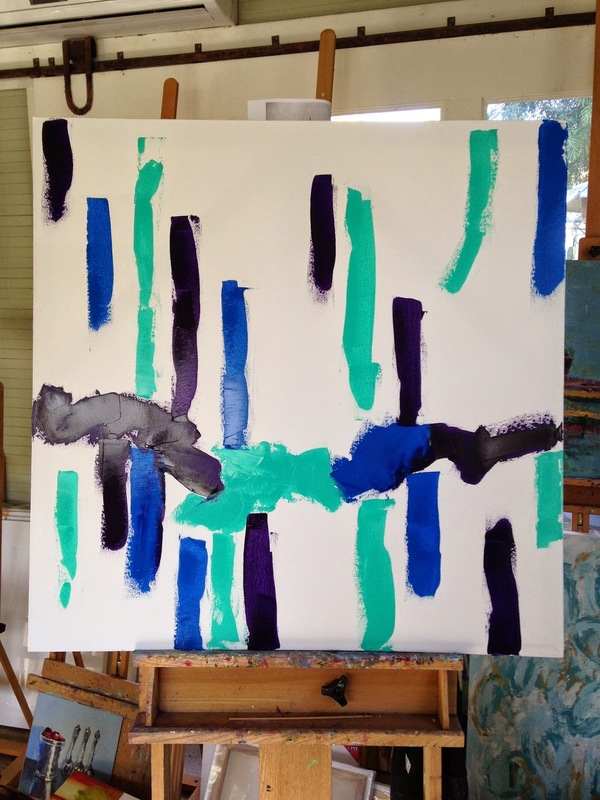 I have learned so much and I love the fact that I can sense a style and direction of my abstract painting. It's been fun sharing my experience. I don't care if every painting isn't perfect. This month is all about the journey. The destination will come. But I never guessed the journey would be so much fun! Acrylic, 20" x 20" on gallery wrap. It's wonderful to be home although six days in 80 degree weather was heaven. Our trip to watch my youngest son play volleyball was a true vacation. Lots of relaxation, sports, great food and yes ... a few cocktails! I had a very successful photo shoot at my favorite Marina in the world on Waikiki Beach! I was back at my abstract workshop this morning. A bit jet lagged but I was very excited about this one. I brought home a painting that looked different from this one. The design was there but I really wanted to add a slight "overcoat" or "wash" of another color all over the top. I am so glad I added it because I like it so much more! 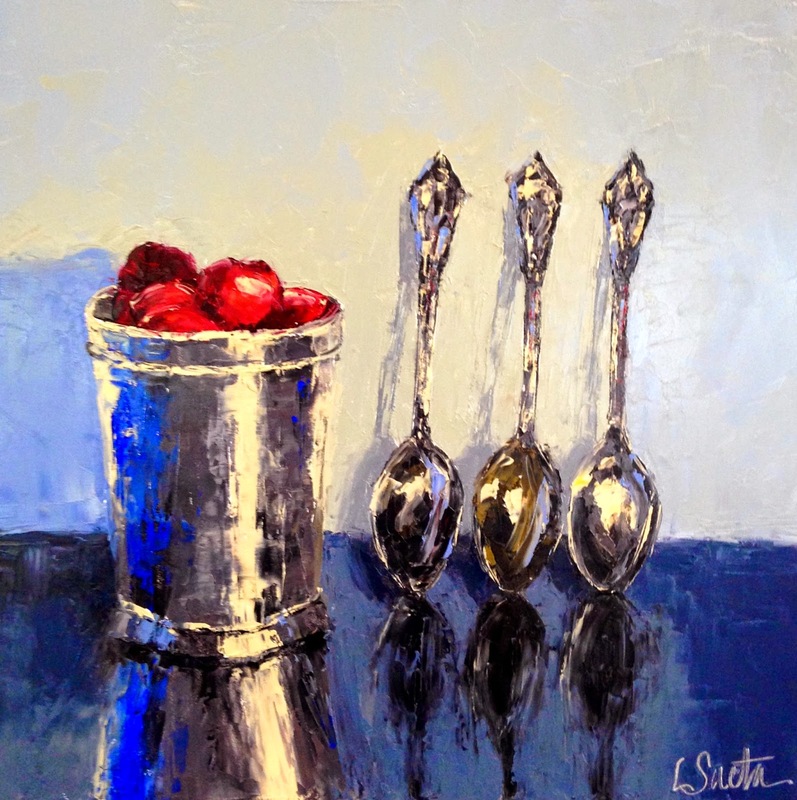 Tomorrow I start teaching a three day palette knife workshop. It will be strange to pull out my easels and not be able to paint abstracts! It looks like I will have to paint my abstract painting after the class is over. Oh my, this is going to be a busy week. Tomorrow is a big day in the challenge. I will give you a hint ... it has to do something with being halfway done! Acrylic, 16" x 12" on gallery wrap. I am cured! Just when you thought I was addicted to "beach house colors", I have found some new colors to inspire me. And I love them! 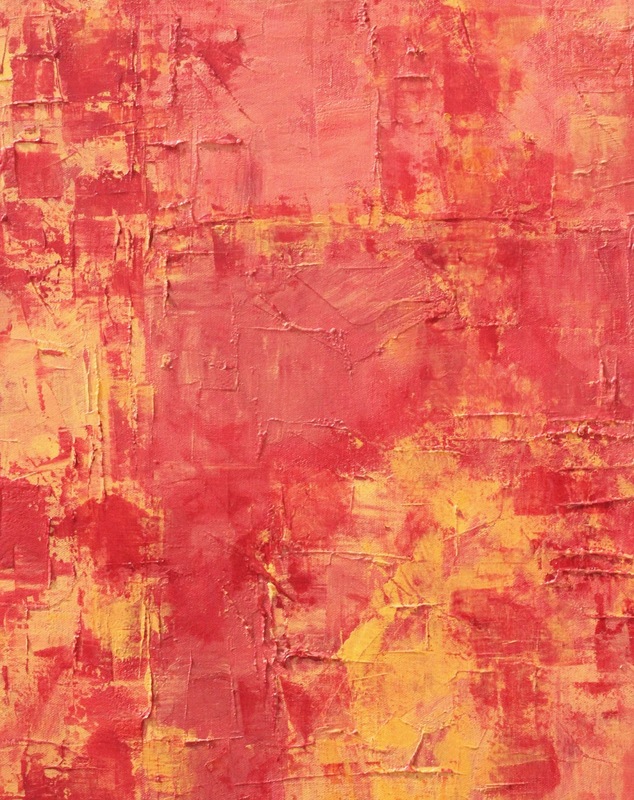 I love the red/orange which is a mixture of Alizarin Crimson and Cad Yellow Medium. Love, love, love. Ok, I am happy. Even if I am back home from Hawaii. Acrylic, 36" x 24" on gallery wrap. If you read my post from yesterday you might remember that I think I might have an addiction to "beach colors" like those seen in this painting. It's true. But it's a healthy addiction, I promise.